When Katy's friend Ameaka, who is from Nigeria, invites her to dinner she begins to wonder about what might be served. Katy is looking forward to the experience, but she's a little fearful she might not like it and she does not want to offend her hosts. As she and her other friends contemplate the many different types of foods served around the world they come to realize that all cultures eat foods which may seem odd to people from other regions, even their own. 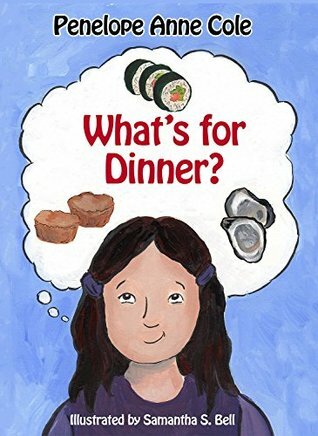 Author Penelope Anne Cole's What's for Dinner? is a wonderful way to introduce young readers to various foods and cultures while promoting the idea of acceptance and trying new things. This book is highly recommended for home and school libraries and has earned the Literary Classics Seal of Approval. Congratulations, Penny! Keep it up!